November is very windy here in Coastal BC. Storms tune up in the Gulf of Alaska and march down the coast with very little respite in between. One blustery evening, Wayne and I were talking about improvements to our float cabin that have increased our quality of life. Little surprise, the top two relate to storms. One was the shock absorber system John invented for our anchor cables. The other was our woodstove chimney cap. 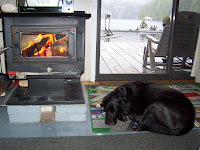 Last December, I shared a solution to our wood stove smoke blow back and downdraft problems. Our friend John found a wind protection chimney cap at RONA. As long as the wind was less than 15 kph (9 mph), our wood stove worked fine. But if a stiff breeze came up, especially a southeast wind, smoke was forced back down the chimney and into the cabin. It sometimes got so bad we had to stop using the stove (hard to do if there was wood burning) and start up our Big Buddy propane heater. The solution was a GW Metal (Item #90142) 6" Revolving Weather Cap. GW Metal is a Canadian company and the Rona shelf name is Cap B Vent High Wind. The cost is $51.99 CAD plus taxes. Check your local home hardware store for a similar version. Last week we had strong 24 kt (47 kph/29 mph) winds during a passing weather system. The result was much different than our previous chimney cap. 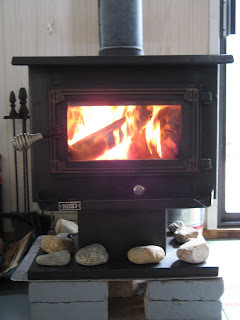 After about six hours of strong, gusty winds, there was only one small blow back of smoke through the wood stove door. Here's a video of our new chimney cap in action. The only problem we've encountered is some smoke escaping from the stove while lighting a fire during light breezes. 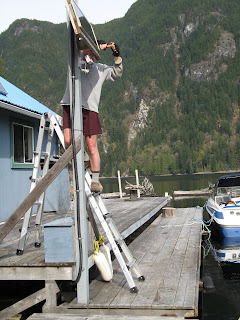 Sometimes we use a long pole to manually move the cap to point into the wind. If it's a very light breeze, burning a twisted piece of newspaper under the smoke shelf before lighting the kindling is enough to start a draw up the chimney pipe. That usually does the trick. The next step in installing our new wood stove thermoelectric generator by TEGPower.com was setting up the water cooling system. Wayne has a background in physics (from college) and I was a school district technology director, but neither of us had the practical skills needed to easily complete the simple electrical "puzzle." Thanks to help and advice from John, and his father Ed, we had the confidence to give it a try. All the trial and error experiments made us feel a bit like Mr. (and Ms.) Wizard from our elementary school days. First, we stopped at Canadian Tire to purchase some wire, connectors, a soldering gun (we haven't found a use for that yet) and a crimping tool. Wayne (lovingly nicknamed Wire Guy) did most of the thinking and wire work and I served as a sounding board and testing assistant. Because we live on a floating cabin, Ron from TEG suggested we draw our water directly from the cold lake that serves as the "foundation" for our home rather than using his standard recirculating cooling system. The colder the water, the more efficient the power generation. If you live in Canada, you know Canadian Tire. Even small towns like Powell River have their own store. It's where you go for everything from gardening supplies to small appliances, oh, and of course, tires. 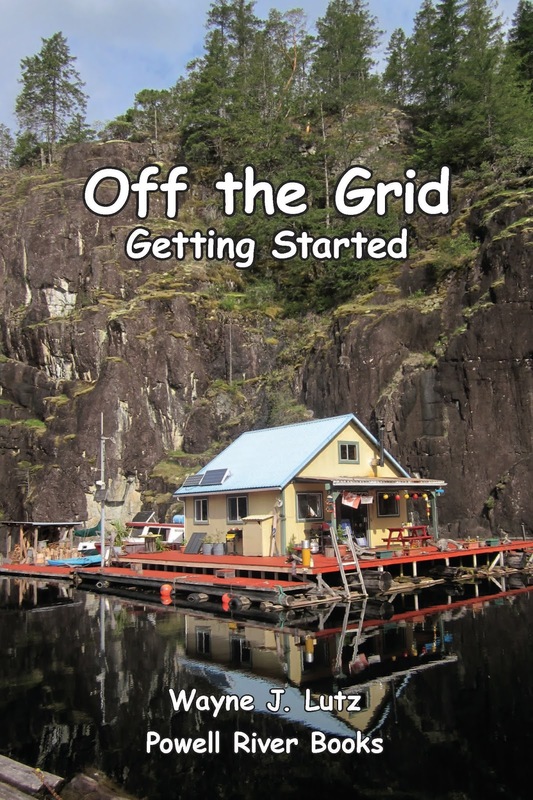 Lately, we've been using two Canadian Tire Eliminator products for extra power at our off the grid cabin, two 15 watt solar panels and a PowerBox 800 battery pack. One nice thing about this 12 volt, 15 watt solar panel is its quick-connect plug that mates directly with the PowerBox. But it also has DC clips to use to charge other types of batteries. The regular price is $99 CAD, but watch for occasional sales. 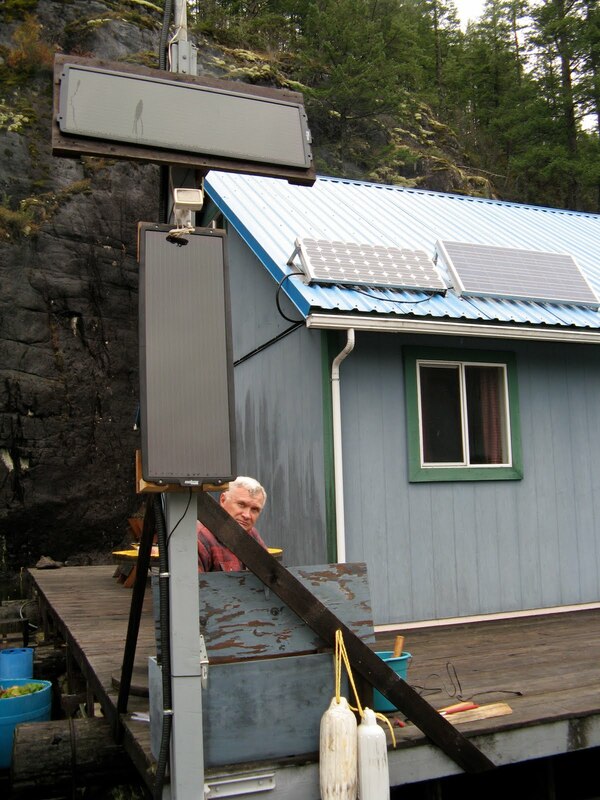 We mounted our panel on the same pole as our wind generator. At the bottom of the pole is a wooden case to house the battery pack during charging. This protects it from the elements (we do get our share of rain). The PowerBox 800 is the most powerful of the four models. It has AC outlets and 28 amp-hours of stored energy when fully charged. There's also a built-in radio, light and alarm clock. If you want to use it as a booster pack for starting or charging a vehicle, it comes with its own cables. 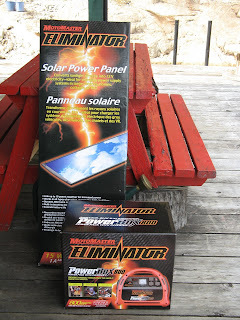 In addition to the direct connection for an Eliminator solar panel, it comes with an AC charger. 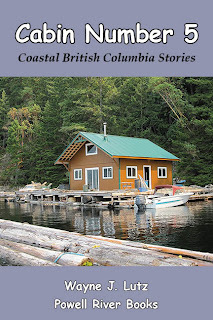 We've had lots of wind and rain here in Coastal BC this week ("Sunshine Coast" RAIN and WIND Warning). Because Powell River is at sea level and the weather is moderated by our coastal location, we hardly ever get snow. But not too far inland and up in elevation there's snow already. I finally got up to the cabin after my bout with a bad cold (flu?). When I woke up the first morning, I was greeted with a beautiful sunrise highlighting the first snowfall on Goat Island. On Sunday, I posted a video (Wicked Winter Weather) about the dedicated service provided by the ferry crew on the Island Princess. Getting to and from Powell River can be a challenge in November because it's a time for lots of rain and wind. 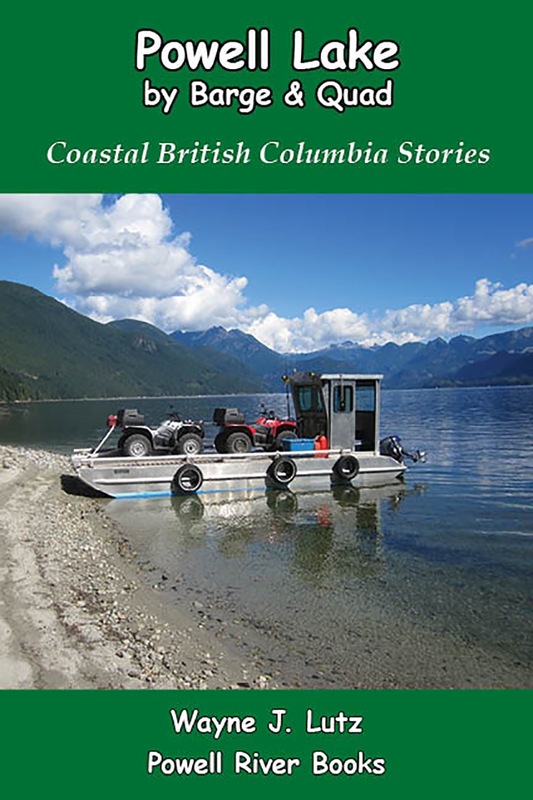 Because Powell River is isolated from the rest of mainland Coastal BC by huge fjords, we are dependent on ferry and airline service for transportation. Pacific Coastal Airlines is a regional airline (that began in Powell River by the way) that provides daily flights to and from Vancouver BC in all kinds of weather. Just like the ferries, they sometimes have to cancel during severe storms, but they continue providing a vital link to the outside world whenever it is safe. The planes used by Pacific Coastal are smaller turbo props well suited to the short strips and weather conditions of our area. They are large enough to accommodate the demand, but small enough to give you the feel of private flying. "Sunshine Coast" RAIN and WIND Warning! Rainfall amounts of 80 to 200 mm by Monday. Eighty millimetres is 3.1 inches and 200 is an astounding 7.9 inches. That's an incredible amount of rain even on the Sunshine Coast (Raincoast). OK, I know that's an oxymoron, but we do get lots of both. But this much all at once is even too much for us to absorb, literally. Some areas will be in danger of flooding for sure. Southeast wind 50 to 70 km/h. If rain isn't bad enough, it came with some pretty brutal winds from the southeast, our typical storm track. I hope our cabin is surviving. It's too dangerous on the lake to go home right now. It's dangerous out on the chuck (ocean) as well, but that doesn't stop of the crew of the Island Princess ferry between Powell River and Texada Island. It's November, the windy time of year. The fjord nature of Powell Lake makes a natural funnel to increase its speed and change its direction. We are fairly protected in Hole in the Wall, but we do get our share. The cliff to the north usually protects us from clearing northwest winds, but not the incoming storms from the southeast. Those winds squeeze through First Narrows, hit the high rock wall, then split off eastward to hit our cabin. Float cabins are anchored to shore with either heavy ropes or steel cables. In our case, it's steel cables. When the wind hits the cabin, it acts like a sail and we are blown backwards to the full extent of the cables to a jerky stop. Then comes the rebound, back into the face of the wind and it starts all over. This puts lots of stress on the cables and their connections. During my first solo trip to the cabin in November 2001 (Up the Lake Chapter 4), I lost two connections. After that, our friend John installed double cables. Those lasted for five years, until another nasty winter storm. After that, John devised a whole new new system. What he came up with is a shock dampening system using old car tires. Instead of connecting the 7/8 inch steel cables from the rock wall directly to the float, he placed a car tire in the middle. The new system has made a huge difference. Instead of roughly jerking the cabin as before, the tires rise out of the water and gently pull the cabin back in place, rocking us gently in the "breeze." Here is a video clip of the shock dampening system in action. 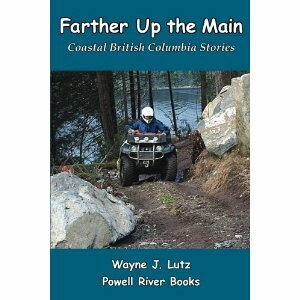 Quite often, Wayne and I hear the Canadian Forces helicopters working in the lower part of Powell Lake. They usually stay south of our cabin in Hole in the Wall, so we can only hear them. But on a recent trip to John's cabin we saw them in action. CFB (Canadian Forces Base) Comox is just across the Strait of Georgia from Powell River. Comox is the location of the Canadian Forces School of Search and Rescue, where all para-rescue specialists in the Canadian Forces, known as Search And Rescue Technicians or "SAR Techs" undergo training. This time of year they must be practicing cold water rescue techniques. The large CH-149 Cormorant Helicopters can carry a crew of 5 and up to 45 standing, 30 seated or 16 stretchers with medics. They have a range of 863 miles or 1389 kilometres. That makes them a good rescue platform here along the cold, western coastline. During practice, the helicopter hovers over the cold waters of Powell Lake. Then a rescue trainee rides a long cable down to the water then after a while, he is reeled back in. Last April I shared pictures of our neighbour Jess putting a roof on his new cabin. I called it "Jess On a Hot Tin Roof." This fall, John has been working hard to get the roof on his new cabin. While a few days were sunny and "warm," none of them were hot. In fact, some were downright rainy, windy and cold. Still, John kept at it to get his hard work covered and protected before the onslaught of winter. So far you've seen John raise his ridge pole and add the rafters. Now it's time for the metal roof to go up. Because the panels were heavy, Wayne and I towed our raft down to the marina to pick up the load. Fortunately, Rona's truck delivered everything right to the raft. OK, I'm getting into dangerous territory here. I'm definitely not a construction expert. I'm not even a construction wannabe. But I did watch John as he put his new cabin roof up stage by stage. His last cabin had a barn style roof. This time, he chose a gable design. First, all the lumber had to be moved up the lake. Our bowrider Campion came in handy for that task. After the center beam was in place, John started adding the rafters. To make their placement easier, prior to raising the side walls, he installed the metal brackets that would hold each rafter in place. Raising the rafters was definitely not a one man job. John's brother Rick and his dad Ed were there to lend helping hands all along the way. John took care of the high work. He went up the extension ladder to accept the upper end of the rafter already cut to the correct angle thanks to Ed's design work. His assistant made sure the bottom of the rafter was snug in the bracket. Before the lower ends of the rafters could be nailed into place, John had to make sure all of the measurements lined up and the walls were straight. To make some final adjustments, it took several ropes and lots of muscle to get it right. Next came the battens, the cross supports on the outside of the rafters. Nailing the battens onto the rafters was like building a ladder. As each batten was added, John climbed the roof to nail the next one in place. The weight of the roof presses down, trying to spread the rafters and walls, constantly trying to push them outwards. To take some of the stress out, collar ties are added. These sturdy cross members help stop this destructive process. Every two years we head down to Eugene for the USC vs Oregon football game. The weather wasn't good enough to fly in 997, so we drove Bertha (Mom's big Buick). We stay at the Eugene Hilton because it's in walking distance of Autzen Stadium. It's also the choice for the USC Train tour organized by Witfawn for loyal Trojan fans, members of the Trojan Marching Band and cheer squad. If you make it to the hotel early enough on Friday, you can join their outdoor pep rally. As we walked to the stadium, we stopped under a pedestrian bridge to don our rain gear. Our first stop was the athletic team entrance. An hour and a half before game time, the USC team arrived with their traditional "rock the bus." Then it was off to the tailgate party sponsored by the Portland Alumni Chapter. A dog, a brew and pep rally got us ready for the game. We get our tickets through StubHub so we always end up in "enemy" territory. At least this time we were near the band.